Greenhouse gas emissions in the United States declined by 1.6% in 2011, the most recent year for which data is available, according to the Inventory of U.S. Greenhouse Gas Emissions and Sinks: 1990-2011, issued by the EPA in April, 2013. The first chart at right shows U.S. greenhouse gas (GHG) emissions for 1990, 2005, and for each of the past 5 years (2007-2011). The 50 states are included, plus the District of Columbia, but U.S. Territories have been omitted. The emissions are shown by sector, with the generation of electrical power included as a separate sector. Land Use & Forestry absorbs more GHG from the atmosphere than it emits, so its contribution is shown as a negative emission. The result is that net GHG emissions (the black line) are reduced from the total emitted by the other sectors. Viewed this way, the generation of electrical power is the largest emitter of GHGs, with transportation second. However, electricity is generated for use in other sectors. 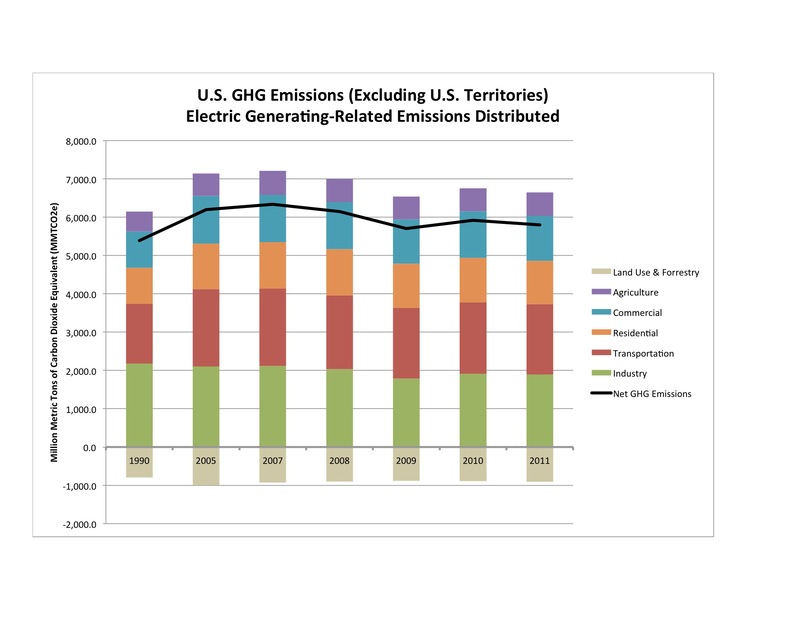 If you distribute the GHGs from electricity to the sectors that consume it, the data looks much different. 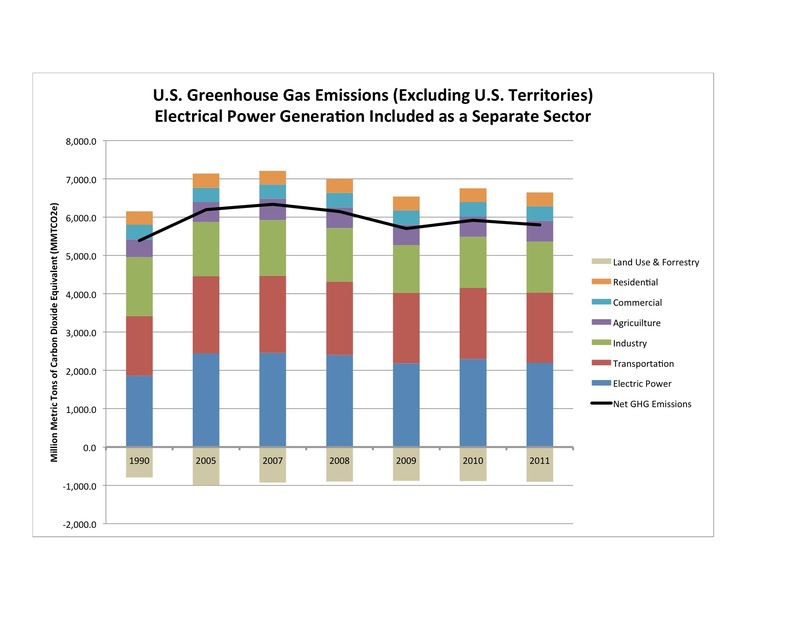 The second chart at right shows U.S. GHG emissions with electricity-related GHGs distributed to their end-use sectors. Again, the District of Columbia has been included, but U.S. Territories have been omitted. Viewed this way, industry is the largest GHG emitter, followed closely by transportation. Land Use & Forestry are still a GHG sink, not a GHG emitter. Between 1990 and 2011, total GHG emissions grew from 6,183.2 to 6,702.3 million metric tons of CO2 equivalent (MMTCO2e). They declined, however, in 1991, 2001, 2006, 2008, 2009, and 2011. Source: EPA, 2013, Inventory of U.S. Greenhous Gas Emissions and Sinks: 1990-2011. (See the third chart at right. Unlike the previous two charts, this one includes U.S. Territories, and it concerns total emissions, not net emissions). The pattern suggests that economic downturns reduce GHG emissions, but that they are probably not the whole story. U.S. GDP grew by about 1.8% in 2011, but total emissions declined by 1.6%, suggesting that GHG reduction policies likely played a role. GHG emission growth rates for the sectors varied. In 2011 Industry emitted less GHG and Land Use & Forestry absorbed more GHG from the atmosphere, but every other sector increased emissions. Distributing electricity-related emissions to their end-use sectors, between 1990 and 2011 the growth was as follows: Commercial +23%, Residential +20%, Agriculture +18%, Transportation +18%, Industry -13%, and Land Use & Forestry -14%. The Inventory does not break out emissions by state, and the last year for which Missouri conducted a greenhouse gas inventory was 1996. However, carbon dioxide is the most important GHG, and combustion of fossil fuel to create energy is the most important source of CO2, accounting for about 79% of all emissions in 2011. Because the Department of Energy collects extensive data on the generation and consumption of energy in the various states, one can calculate the amount of GHG emitted by the combustion of fossil fuel for each state. The result leaves out the effects of Agriculture and Land Use & Forestry, but it nevertheless captures the lions share of GHG emissions. The following post will look at that data. EPA. 2013. Inventory of U.S. Greenhouse Gas Emissions and Sinks: 1990-2011. EPA 430-R-13-001. EPA » Learn the Issues/Climate Change » Greenhouse Gas Emissions » National Data. http://www.epa.gov/climatechange/ghgemissions/usinventoryreport.html. Missouri Department of Natural Resources. 1999. Greenhouse Gas Emission Trends and Projections for Missouri, 1990-2015. http://www.dnr.mo.gov/energy/cc/ghg.htm. By mogreenstats in Climate Change, Greenhouse Gas Emissions on 2013/12/26 .